Removing Roof Stains-Louisville-Kentucky: Is your roof cleaner really certified? There are some people posing as certified roof cleaners, that are NOT certified by anyone. There is only 1 organization that offer certification training for roof cleaners. Roof Cleaners Institute of America (RCIA). RCIA is a professional organization that require the candidate for certification to learn a vast amount of knowledge, perform a minimum number of roof cleanings, take an oral test and provide proof of insurance and business permitting. This is a somewhat time consuming effort. Not everyone is certified the first time. It is now apparent that some are claiming to be certified when in fact they have only begun the process and do not posses the knowledge or experience to be officially certified by this organization. When you are shopping for a roof cleaning contractor ensure that they are officially certified, such as Qwik Roof Cleaners, Louisville Ky., who has obtained the certification by completing the required study requirements and other items necessary to be officially certified by this professional organization. 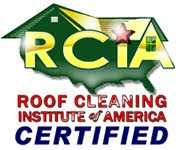 At present, Qwik Roof Cleaners, Louisville ky. is certified by RCIA for a totally professional approach to this industry. Qwik Roof Cleaners, Louisville Ky is the first Certified Roof Cleaner in Louisville Ky. and is one of only 3 in the state of Kentucky. Always look for the symbol and certification of this organization to ensure you get professional results for your money.